Mei Sakura (佐倉 愛衣, Sakura Mei?) is Takane's underclassmen whom she refers to as "onee-sama". She is deemed as a skilled Ministra Magi whose artifact is a broomstick. 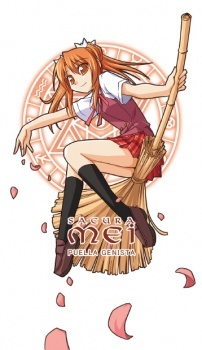 Mei is also a transfer student, sent to study from a North American mage academy before the Mahora Festival Arc. She, Takane and Gandolfini tried to arrest Chao before the festival, but released her on Negi's behalf. Mei seems to have an elemental magic affinity for fire, and her pactio artifact is a broom that she uses for combat as well as for transportation. She and Takane entered the Mahora festival fighting tournament in order to discipline Negi, but she was quickly blown right off the fighting stage by Kotarō, who then had to rescue her from drowning, as Mei can't swim. When magic is made public, the press constantly hounds her. She joins Takane in their mission to arrest Negi's group, but is defeated easily and also stripped bare. Nodoka used her Pactio artifact on Mei to find out where Negi has been held, and Asuna comforts Mei by promising her that they will return the world back to normal. After returning to the third day of the festival, Mei was shown along with Takane entering in the battle against Chao's robot army. She's recently stepped up her training with encouragement from Kotarō, but the dog-boy is too busy with his own training to personally help her out. Natsumi Murakami has displayed signs of jealousy when Kotaro was talking to Mei, but it's unknown how Kotaro and Mei feel toward each other yet.